Nothing is scarier than entering a store with no price tags. 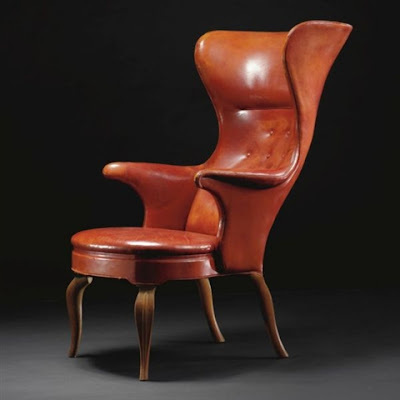 A black leather 1938 version of this Frits Henningsen Highback Wingchair (which made its debut in '35) is available at J.F. Chen in L.A., but you have to contact them for the price. Prepare for sticker shock if you make the call. One went for $48,000 in November 2004, according to The New York Times. The brown version pictured went up for auction in 2006, but ArtNet is being polite and refuses to discuss money on this one. UPDATE: Anthropologie's Archibald canvas and leather chair closely resembles the Henningsen version -- and is on sale for $499! What a beautiful chair. Big sigh. BTW, I came across your fantastic and inspiring blog via Habitually Chic. I'll be visiting here often! Thank you so much, uptown arts! I'll visit you, too. One of these chairs sits in some modern architectural gem of a home in Scotland. I must find photos. It's a perfect melding of old and new designs. A great 19th century portrait hang behind the desk...and then there's the chair.